Best synthetic bag for the price. I got this bag for my first 'real' backpacking bag and used it over 1400 miles on the PCT (border to Sierra City). Overall I think it's a great bag for the price and it will remain a staple in my gear for excursions that could be moist or chilly. Having said that, I have to agree with other reviews that I've read in that it is not quite a 20° bag, more like 30 or 40, but this can be easily mended with any liner really (I just use a poly one). This could be a little biased too, as I tend to sleep freezing cold no matter what, but I do use a closed cell foam sleeping pad. My BF has the men's and he complains it's too hot! I'm a small woman (5'2" ~120lb) so I have no complaints about size or snugness. The main reason I chose this over an Ultralamina was to be able to mate mine and my partners bag, so I love the opening zipper — very easy to use and can be opened and used as a quilt if it's pretty warm, a feature I definitely prefer over the Ultralamina's awkward half length zip. Also I chose this bag because I have an unnatural fear of my bag getting wet and this has definitely kept me warm even when drenched, and it dries super quick so that takes care of that quite well. Synthetics are simply inferior in packability compared to down, but for me I'd rather know that I'll be warm despite damp conditions and IMO this bag is pretty packable for a synth. Not great, but doable. It's certainly not for UL hikers, weighing in at about 2lb10oz. It does well in not losing loft though either for a continuous fiber synth. All in all I may have to give this bag the title of best synthetic on the market, it has done me well thus far! 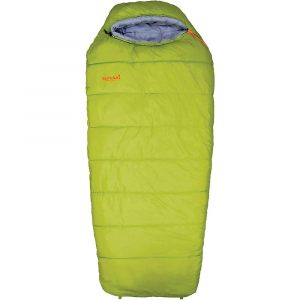 It truly is the Cat's Meow and I would surely recommend it to anyone looking for a solid synthetic 3-season sleeping bag. Price Paid: I don't remember what I paid for it. I bought the Women's Cat's Meow several years ago, so this may be an older version than the one you may be considering for a purchase. 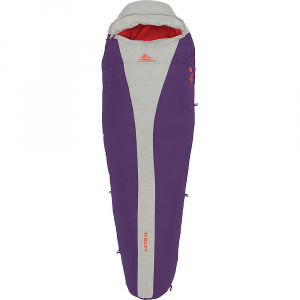 I am a 5'2" woman with a frame to match and my sleeping bag was said to be designed for a 5'6" woman. I am also a Southern Californian who is less adaptable to weather changes. The zipper pulls have glow-in-the-dark tabs, making it easier to find in the evenings after a long hike when I just want to crawl in my bag and sleep. Unfortunately after about a year, my zipper began snagging on my bag. There were days I thought I was going to be trapped in my sleeping bag or feared that I would tear my bag while trying to get in. 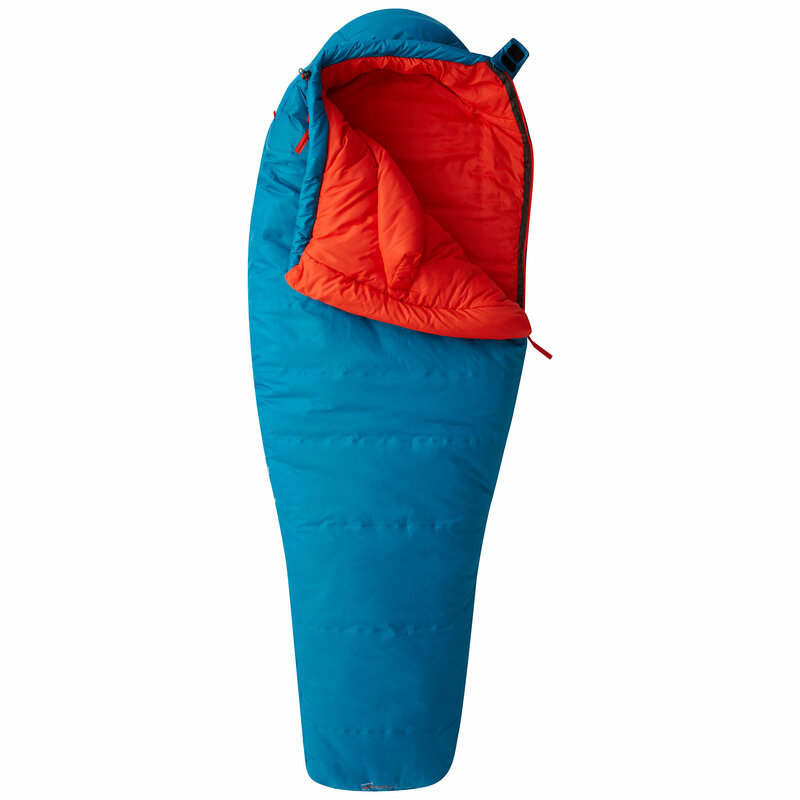 It's also harder to ask for help unzipping your sleeping bag if you are in a bivy. The designers put a lot of thought into the construction with the warm flannel bits protecting and warming your extremities. I have crawled into the bag and stuck my cold hands in the nice muff area and had them warm up fairly quickly compared to staying outside and trying to rub them together and blow into them or shoving them in jacket pockets. The material they used on the inside of the bag other than the flannel-like sections feel clean even after a 9 day trip after having been glopped in mud, rolled in sand, waded in a semi-mucky creek. Unfortunately for me my non-standard physique this is less like the tight mummy bag one would expect making my body work harder to warm up more bag space, which could be a positive for you if you don't like tight spaces. Additionally, my short legs only allow part of my feet reach the warm flannel region designed to keep your feet warm. I have also gotten cold while desert and mountain camping. On "colder" nights (55 and below) if I don't pull the the strings on the hood in, my shoulders can get cold too. 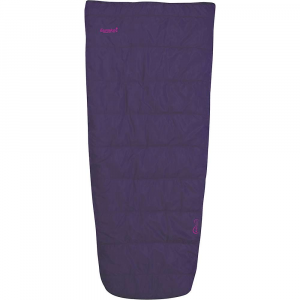 Overall, it is the best and most comfortable sleeping bag I've ever had. Some bags, and manufacturers, rate their bags conservatively: this is not one of them. 20 degrees is TRULY a survival temperature on this entry-level bag. It is thoroughly enjoyable as a 50 degree, but in the 40's, if you're a cold sleeper you'll will be chilled, by 30 you'll need copious layers (read: down sweater, cap 3, pants, down booties, double socks.....), and by 20, despite donning every piece of clothing you brought including a hat and stuff sacks modified as gloves, you'll spend the later a.m.'s awake and shivering. Of course, this is very basic bag (while still being legitimate, read: not from a big-box). And, if used in appropriate temperatures, the bag does have a some decent qualities. For a synthetic it does stuff down rather small - a bit smaller than a volleyball, and is relatively light. My favorite quality, and the reason for choosing this particular synthetic over others, is its ability to zip into it's partner (the men's and women's come in both right and left-handed zippers, not to mention regular and long sizes). Of course, the zip-in option causes a big gap as the hoods can't cinch down so it really only does apply in warm climes. Overall, this bag is ok in warmer temperatures, certainly the temp rating is anything but conservative. It is of decent, albeit entry level, quality which is reflected in the relatively low price. Good for wet, warm climes when down just won't do. I bought this as a replacement for my old Kelty summer bag that is not keeping me warm anymore. I have been using mummy bags for 30 years and have never been unhappy with one before. I immediately took this bag out on a high-altitude June trip in Colorado to hike some snowy 14,000+ -foot peaks. Temps were below freezing every night, but the Cat's Meow was warm enough to make me sweat and yet compressible enough to pack easily in the morning. Polarguard Delta is awesome. Supposedly this bag was designed for women, but it's pretty obvious to me that the kind of woman the designers have in mind who sleeps flat on her back all night long without ever moving a muscle (like if she were in a coma). Compared with my previous mummy bags, this one is just very uncomfortable for a sleeper who tosses and turns and who likes to sleep on one side and then the other. The main problem is that the lower part of the bag is overly narrow and twists uncomfortably at the slightest movement. I also found that the hood part of the bag was cumbersome and got in the way when I tried to sleep (I prefer to wear a hat to bed rather than encase my head in a hood). North Face's guideline is that the "regular" size women's bag will fit up to a height of 5'6". I'm a little less than that and would recommend a "long" for anyone taller than about 5'4". If I lie down full length with my head in the hood, it seems like the bag is not long enough. 1. Comes with a cute zippered pocket at the top of the main zipper. Why? I do not know. I would not put anything hard in there lest it poke me while sleeping, and I would not put anything delicate there because I would smash it while sleeping. 2. Comes with a pointless "handwarmer" pocket inside. Don't they know that the warmest place for your hands inside your sleeping bag is next to your skin, not in some separate pocket? 3. Comes in pretty colors -- baby blue and silver. It is such a light blue that I expect it would show dirt and grunge over time, requiring that the bag be laundered more frequently. 4. The main zipper jammed the third night the bag was used, eventually requiring me to find my glasses and a headlamp and risk waking my companion. I'll have to put my (now used) Cat's Meow bag on Craigslist and get myself a normal "men's" cut mummy bag that provides a couple inches more of girth for the legs and does not come with a ridiculous, over-engineered hood like the Cat's Meow does. The first night I ever used this bag I fell in love with it. It is very warm and comfortable even in wet and humid weather. The full length zipper is very nice for warm weather and ventalation. Great bag and very good value. Keeps you warm in the low 30s but I would not go any farther than that. Overall, a great bag with nice features and it keeps you warm and cozy. The fit is a bit confining but all mummy bags are like that. 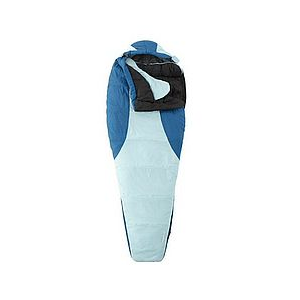 Great Sleeping Bag!! This bag accompanied me on an 836 mile bike trip from Seattle to San Fansisco and I must say, I liked it very much. It worked well in most of the temperatures I encountered... but there were a few nights where I had to bundle up first before going to sleep (ie, long johns, 100 weight fleece jacket, 200 weight fleece jacket and pants, wool socks, wool hat...) in order to be comfortable. I love that the bag fits my size (I'm 5'2") although, I wonder if anyone more than an inch or two taller than me would be able to use it. It packs down really nicely, and the compression sack made fitting it onto my bike much easyer. However, after a solid month and a half being squished down, it has yet to regain its orginal "puff".